Downey, California is best remembered for the spacecrafts, fighter jets and B-1 bombers built there over the past three or four decades. But for 3 hours on a warm summer June evening, progressive Armageddon found its way into the city’s sold-out 700 seat community theatrer. Jordan Rudess, Tony Levin, John Petrucci and Mike Portnoy reunited their successful Liquid Tension Experiment musical project. Since 2008 marked 10 years since prog met prog metal, it wasn’t as simple as Dream Theater meets King Crimson. It was quite the coup for CalProg promoter Jim “Papa J” Harrel, who corralled this show from his close friendship with drummer, Mike Portnoy. “The show sold out very quickly with little promotion,” Harrel said. He polled the audience during the introductions and at least 80% of those in attendance fancied themselves as musicians in some form or fashion. The 11 song set opened with “Acid Rain” from the second LTE album which the crowd recognized quickly and enthusiastically. Petrucci’s solo was quick, precise and played in sharply played multiple minor keys. The next few songs came from the first LTE album. “Kindred Spirits” lead out and sounded very Crimson/Floyd like. Next Levin broke out the chapman stick and we got a medley/jam of “Freedom of Speech” and “Another Dimension” with an extended improve/jam in the middle. The show had several duet and solo moments. 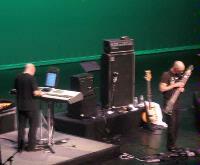 Rudess and Petrucci performed a bluesy movie score style piece filled with beautiful arpeggios. A guitar and bass duet turned into a funky version of “When the Water Breaks” which led into another improv jam by the group during the second set. After the jam, the music spun into the Gershwin classic “Rhapsody in Blue” which spiraled back and forth between classical and progressive underscores. The crowd was highly enthused and they were thoroughly entertained by this cover. The band returned for an encore of “Osmosis” and “Paradigm Shift” which were my favorite pieces of the night containing dramatically emotional Jordan Rudess solos. Jordan Rudess may very well be the most talented keyboard musician I have ever seen. His music can be found in the rock section of most virtual music stores but his diverse talents and Juilliard School of Music background cover so much more territory. In this show, Jordan was found playing his Roland Phantom G8 and it felt like he never stopped playing. I would love to have taken a picture of him turning his head and smiling to the audience when his spinning keyboard faces stage right or left. Tony Levin’s musical education spans many decades of talented artists. He continues to be a mainstay with Peter Gabriel and King Crimson. Possibly the most respected bassist in rock music today, his resume also include Paul Simon, Steve Gadd, Alice Cooper, Robert Fripp, various members of Yes and Lou Reed. Being the quintessential bassist and most remembered for his Chapman stick work, there is so much more to Levin’s skill and presence than just one of the guitarists who stand next to the drummer. Since the four musicians do not play together often, you could find Levin, standing center stage, constantly making eye contact and using body language with all the other band members. Wikipedia reports that LTE headlined NEARfest 2008 followed by a six city tour to celebrate the band’s 10 year anniversary to create "whole new musical experiences.” Liquid Tension Experiment announced that there will be a new live album CD/DVD coming soon, plans for a new studio album, as well as an "Official Bootleg" of their live show in Chicago on June 25th. 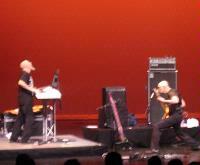 On that night, Rudess's keyboard malfunctioned halfway through the show. While Rudess was on the phone with Roland of Japan trying to figure out the problem, the other three members jammed on stage. 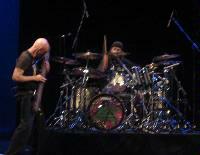 This went on for over an hour, leading up to the finale where Rudess took Petrucci's guitar and played, while Petrucci played Levin's bass and Levin played his Chapman stick. 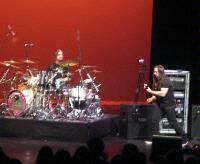 Following that, Portnoy grabbed Levin's bass and Charlie Benante played drums for the grand finale. 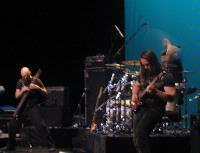 Although Rudess had no problems this night, John Petrucci did. Petrucci worked feverously on his failing equipment. Portnoy could be seen next to the keyboard stand with a handwritten piece of paper that said, “KEEP PLAYING”. Rudess smiled once again and did just that as his keyboard solo was extended and he improvised for an additional 10 minutes which was complete fun! Having seen Jordan Rudess perform a few times outside of Dream Theater, I remain amazed that his mind can work faster than his fingers. The music that comes from his keyboards is “not of this world”. Having been blessed with the opportunity to see Stevie Ray Vaughn live several times, I compare these two musicians in that the music they create flows from the soul rather than from the mind. I recall an interview with Eric Clapton talking about SRV and how after seeing Vaughn perform live for the first time, he stopped playing guitar for 3 weeks out of frustration. Taking the liberty of paraphrasing, Clapton said, “I’ve worked all my life to become a great guitarist and this kid steps up and the music flowed from him in a way I could never simulate. He had a musical channel with God and Stevie was God’s instrument.” I can’t think of any description more suited for Jordan Rudess. Not to raise the pedestal any higher, another Rudess kudo can be found in a story he told in May 2007. 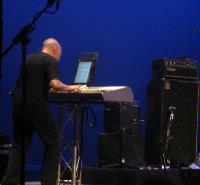 Rudess had been recruited several years back by Steve Morse, of Dixie Dregs fame, to tour with them. The catalog had been delivered to his home so he could learn the songs. During his warm-ups at his first band rehearsal, he was whipping through some of the material when drummer Rod Morgenstein stopped to listen because Rudess was playing, from memory, the recorded musical tracks that overlaid Rod’s drum solo. In one of their first gigs, power was lost for all but the keyboards and drums which led to a 15 minute keyboard-drum duet which left the crowd standing and applauding for some time. John Petrucci idolized virtuoso guitarists like SRV, Alan Holdsworth, Al DiMeola and Steve Howe. Petrucci is respected for his variety of guitar styles and his skills were reflected during his solo between “Freedom of Speech” and “Another Dimension.” It was quite noticeable throughout the evening that Petrucci is able to pick at high speeds with both hands, sometimes switching back and forth between them during rifs. Mike Portnoy is the type of drummer that musicians want to perform and create with. The limelight is unimportant while consistently being on top of the beat is. He is amazingly precise, fast, versatile and fun to watch because of the positive body language that makes his presence a force. My musical education would not be complete had I not had the opportunity to see this remarkable performance by these amazing musicians.